February 25, 2017 /Photography News/ Learn how to achieve consistent and excellent results in all aspects of dental photography. This free course will cover all aspects of the use of digital photography in dental practice: intra-oral, extra-oral, and portraits. Participants will be taken through photography, from the basics of choosing correct equipment and setting it up, to optimum settings, techniques for consistent imaging and the safe storage of images. The course is taught by the team that delivers the online masters degree course in Advanced General Dental Practice from the School of Dentistry at the University of Birmingham UK, and will involve about six hours per week of your time. No previous knowledge is necessary, but there will be certain requirements in terms of equipment necessary to complete the course - particularly access to a digital SLR camera. Advice on choosing this will be given at the start of the course, but if you’re keen to get a head start, then you can download Equipment Recommendations (PDF, 232k). I never thought of taking an online course before. Though I'm not interested in dental photography, this makes me curious of the new skills I can achieve from the comfort of my home. I will push my boundaries and give it a try. Very useful article for me, there is more information plz share.. 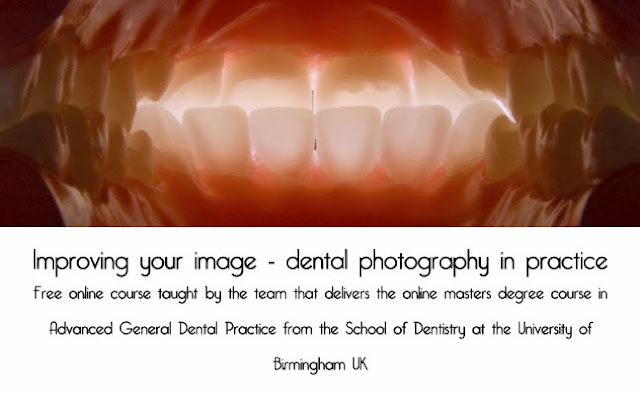 This course will cover all aspects of the use of digital photography in dental practice. It's help to dentist for their good work. On that time many online website provide various course. LEED is one of them. This course Prepare for LEED Exam Preparation. Free online corse nice posts..